With an increasingly ageing prison population, it is very important to ensure that those nearing their end of life in prison are able to receive the right care at the right time. The GSF Programme has now been adapted for Prisons. 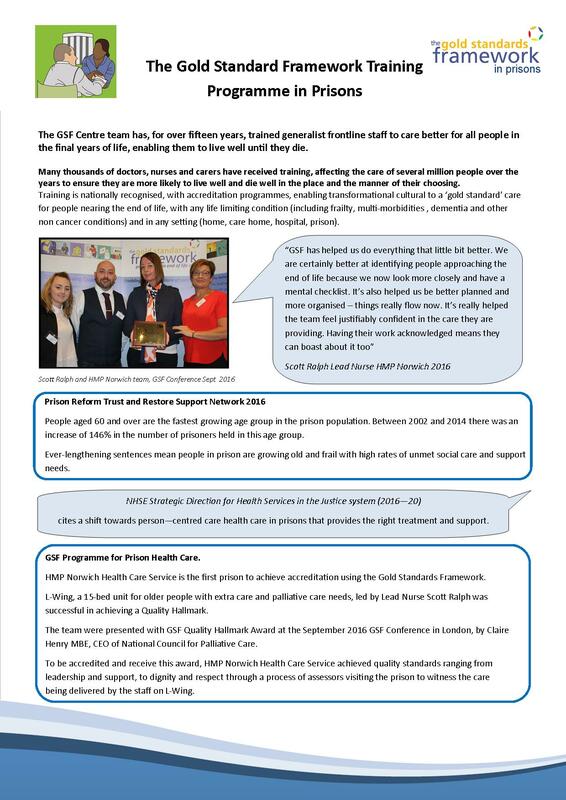 We have worked with one prison healthcare centre, who have achieved the Quality Hallmark Award. We are now looking for a small number of interested prisons to be part of the next phase of GSF in Prisons, and to help shape how the programme develops. We know that this work is making a difference to patients, their families and the staff who provide the care. Please join us in being part of this national momentum, we will be very pleased to have you on board and look forward to working with you and supporting you to achieve the very best quality of care – ‘the Gold Standard of Care’. Please view our GSF Prison Programme flyer, below, which gives further details of the programme content and format. To express your interest in the programme please complete the Expressions of Interest form.